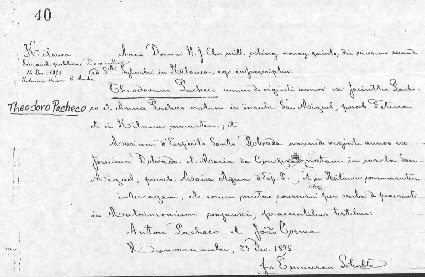 This is the marriage record for my great grandparents, Maria de Braga and Theodoro Pacheco. They were married 22 Dec 1895 at St. Sylvester’s Church in Kilauea, Kauai, Hawaii. They were both 19 when they were married. The record is written in Latin. I found it amusing that they latinized the names. My Azorean ancestors became Theodorum and Mariam. Unfortunately, I don’t have a photograph from their wedding day. I don’t even have a photograph of them together. I’m not even sure if there was much of an affair beyond tying the knot. There was a custom that the family of the bride (meaning the women) cooked a meal for all of the wedding guests. It was an affair that took several days to prepare for. It was so much work that the mother of bride usually didn’t get to go to the church to see her daughter get married. But, my relatives were poor laborers. So, who knows. Their wedding was just a couple of days before Christmas. Maybe it was a rushed affair, sign the certificate, and see ya later. I only know that their first child was born 8 1/2 months later. I wish that my ancestors had been the keepers of diaries and journals. Then I would have the answers to these questions. I can only guess what their wedding day must have been like.